A lion dance was just one of the many events that provided entertainment at Stephen and Jen’s wedding. Stephen and Jen’s wedding party at Stephen’s family owned restaurant, Emerald Chinese Cuisine, was the cap on a week long celebration for the two of them. Their ceremony and (first) reception took place a week earlier in Northern California. Wanting to celebrate with San Diego family and friend, the best solution was to throw a party in Southern California. In addition to dancing, there was a lion dance, a solo singing performance, photobooth and the slow motion video booth was set up and the result shows what a great time everyone had. Here’s the highlights from the video booth. And here’s a look at the setlist. 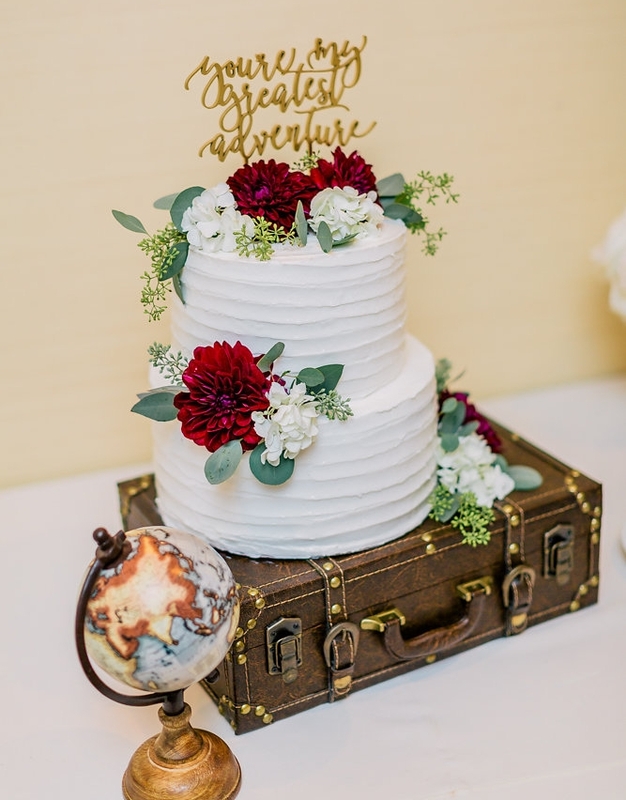 The “travel” theme was carried out even on this wedding cake. Bianca and Chuck’s wedding at the Kona Kai Resort and Spa on September 1, 2017 was no small affair. With more than 300 guests filling out the venues largest ballroom, it was full of friends and family that were there to celebrate this special couple. When it came time for the dance party, those hundreds of guests filled out the floor. There were so many great dance tunes, highlighted by Lil Wayne’s “Mrs. Officer,” a nod to Bianca who is a San Diego County sheriff. Here’s a look at the rest of the songs for the night. Chuck and Bianca’s first dance at their wedding, which took place at the Kona Kai Resort and Spa. Leo and Shruti wedding celebration was so big, they took over the entire Museum of Man in San Diego. With seating on both the first and floors for their guests, this wedding was beautiful as it also recognized Shruti’s Indian culture. Friends and family traveled in from all over the world for this night, which was actually the cap to a full week of celebrations as per Indian wedding tradition. But that didn’t slow anyone down, as a great dance party concluded the festivities.